Tonight at 7:00PM EST e-mol will be going down for maintenance. It should be down for no more than a few hours. We have completed the routine maintenance and updates, and everything went well. We apologize for any inconvenience this downtime may have caused you. Even the best laid plans can go bad, as was the case this weekend. We performed a major upgrade which involved moving e-mol from one server to another, and included software updates. Despite our best efforts to make it painless for you, our users, some things didn't go as planned. But worry not! Things are working at 100% again. Thank you for being patient, and for your continued use of e-mol! E-mol will be down from 8:00PM-9:00PM EST for maintenance and upgrades tonight. These upgrades will allow us to handle 10 times the number of users data and make functions such as search faster. We apologies if this causes you any inconvenience. Have you ever wondered how we at e-Mol get the word out about our free service? Do we advertise? Do we spam? No! So, you want to share your planner with your collegues by default, and send all your reminders to your cell phone? Boy, do we hear ya. In fact, we heard you so clearly that we have now made it possible! That's right, now you can set the defaults for both "Public Viewing" as well as "Default Send Reminders To:" in Configure->Planner. So, go plan your life and make that phone vibrate! The holidays have come and gone, and we are already a full month into the new year. So what have the fine folks at e-Mol been up to? Well, we at e-Mol have been up to plenty. As always, we continue to fight the dreaded spammers. We have recently done an upgrade to our backend database server. 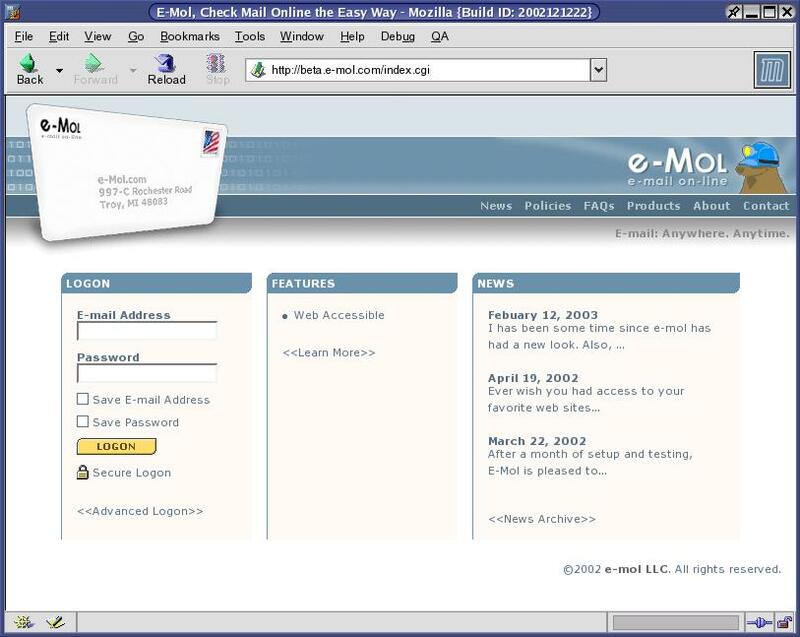 And, of course, we are always trying to make e-Mol the best online email client that it can be. So, if you have suggetions or comments, let us hear 'em! e-Mol will be down for maintenance for a few hours Dec 29 at 11:00PM EST. We apologize for this inconvenience. Happy Holidays from all of us at e-Mol. Sometimes, no news is the best news you can get. And that is the story here at e-Mol this week. Rest assured, that doesn't mean we are just sitting around. We continue to work on improvements to e-Mol, actively fight spammers, and do our best to respond to your questions with timely answers. So, as always, if you have a question, problem, suggestions, or just want to say, "Hi! ", just drop us an email at qns@e-Mol.com. We'd love to hear from you! Here at e-Mol we hate spammers more than most. Not only is it a hassle to dig through all the garbage just to get to your real email, but spammers also use up valuable resources (bandwidth, storage space, etc...) that the rest of us would better use. So, we've decided to take a stand. We have taken many steps to try and thwart spammers from using e-Mol for such heinous practices as spamming. Some of these steps include limiting the number of users a person can send a single email to, as well as limiting the total number of messages a person can send per day. While these limits are high enough they should not effect you, the legitimate user, they should put a cramp in spammers practices. As always, if you want more information, have questions, or just like to say hi, contact us at qns@e-Mol.com, we'd love to hear from you! While we never want our users to have problems, we do love hearing from them. Lately we have been getting a lot of QNS email ranging from problems, to some great suggestions, and even some people just wanting to say, "Hi!" So, want to make sure we didn't fall asleep at the computer? Have a problem? Or do you have the next killer idea for e-Mol? Let us know by sending an email to qns@e-Mol.com. Everybody has a voice, and we at e-Mol are listening! Everybody has a voice. For a while it seemed that the support team at e-Mol forgot to turn on their ears and your voices were not heard. But, we have turned up our listening devices, put on a fresh pot of coffee, and are now ready to listen to what YOU have to say! It's fast (usually within a few hours), free, and always available. So, voice that opinion! Let us know what you REALLY think. To accommodate our continuing growth we have moved e-mol to a new location. This move was needed to help you, our faithful users, see better response time, as well as faster downloads. You may have noticed moments when e-mol was unavailable during this move, and we apologize for any inconvenience this may have caused you. But we think the better service was worth it! As some of you may have noticed over the last 6 weeks we have been making e-mol faster: not always by leaps and bounds but little by little. The upgrades have been over a long period so as not to cause any down time. There are still a few more improvements that need to be made so that things are a little faster. As always, we'll keep you posted! Drafts - Writing an e-mail that you need to save so you can finish it later? Now you can with the Save Drafts feature. Save Attachments - Attachments sent with your e-mails can be saved in your Sent Mail folder with the e-mail. New for our Premium Users: Archived Mail! Store a copy of your e-mail on your hard drive. Zip, Click, and a Download away. Sick of ads for Viagra, Cialis, and Xanax? With e-Mol's new and improved spam control system our Premium Users will enjoy a cleaner then ever Inbox! Are you a Premium User yet??? Now on the Compose Email- e-Mol anticipates which e-mail address from your address book you are typing. Enter the first letter of someone's name or address and e-Mol will suggest it in a pull-down list. All you have to do is point and click! 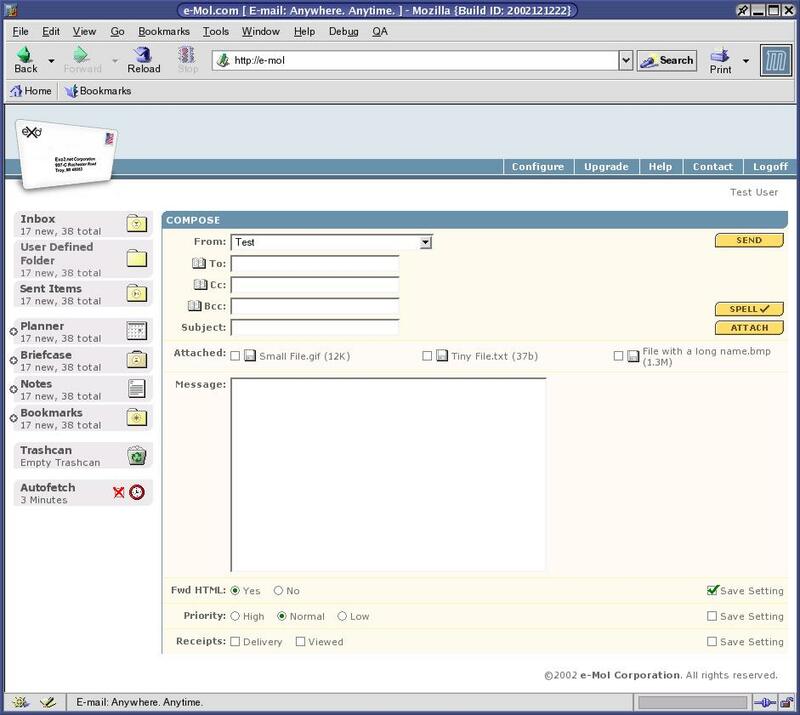 Now e-Mol lets you manage your contacts faster and easier than before. The main address page now displays phone numbers for your contacts. This eliminates an extra step when calling someone. Also for those with many contacts, e-Mol now has a quick search accessible when composing an e-mail. Now there is no need to scan through all your contacts. Just start typing their name and e-Mol will find them. Like a child going from their tricycle to a two-wheeler, e-Mol is moving on up. Some time ago e-Mol purchased a larger, and substantially heavier, network storage array. After many months of practice and a few falls, we are ready to take our two-wheeler out around the block. As part of the ride we are taking all of you along. What does this mean? MORE SPACE! We've added a new search facility to the e-Mol address book to make managing your contacts even easier. You can also sort your address book by name, company or e-mail address. Welcome to the new and improved e-Mol! We've been hard at work redesigning e-Mol based on your feedback. In addition to the new look, new features have been added and many existing services have been enhanced. Log in to check out everything that's new. We're always looking for ways to improve, so be sure to let us know what you think! It has been some time since e-mol has had a new look. Also, we have been receiving comments on what people do and do not like about current layout and color schema. For all the comments and suggestions have been looked at and with them we have a NEW E-MOL on the way. Now you can see what will be happening to e-mol in the coming months. Take a sneak peek at the new Login page, Inbox and Compose. Some day soon the new e-mol will be poping up so keep an eye out! Ever wish you had access to your favorite web sites whereever you go? Well with E-Mol, you can have your Bookmarks on any web browser! Just add your favorite web sites to the new E-Mol Bookmarks. After a month of setup and testing, E-Mol is pleased to announce that our Troy data center is now dual-homed to the Internet. This guaranties you that E-Mol will be there when you need it, even in the event of a cut cable. E-mol had some down time this weekend. :-( Many of you may have noticed problems getting to e-mol recently. This was caused by our local T1 loop from Ameritech being down. The problem has been corrected and we should be more reliable then ever! For those of you that spell like us e-mol developers we are pleased to announce a spell checker. Once you have composed your e-mail e-mol can check the spelling. One advanced features of the spell checker, it has a customizable personal dictionary. Try it out before you send your next e-mail! In an effort to make e-mol a better and more useful place we have again added a major new feature. E-mol now has a planner! The planner allows you to schedule appointments and manage tasks. The planner can send you e-mail reminders, let you know about someone's birthday, and you can even share you schedule with anyone on the web. Take a look at the e-mol planner today! We are continuing to add features to e-mol and this week we are proud to announce the addition of a Virus Scanner. Each e-mail is opened and scanned for viruses when you open it. Attachments are scanned and marked as Clean, Inoculated, or Virus. If a virus is detected the file is cleaned or if it is unable to be cleaned the file is unavailable to you, for your protection. E-mol has a new feature! You may have noticed the addition of a Briefcase on the left hand bar. The Briefcase is a place where you can upload and store files so they can be accessed from any computer. Many of you may have noticed something new on your E-Mol pages, banner advertisements. For years E-mol has remained a free service and we will keep it that way. Unfortunately as costs for bandwidth have gone up we had to look into financial support for E-mol. It was decided that banner ads were a good solution and are not no intrusive. It has been over a year since people have seen a change to e-mol. Now the change has come! For the past year we at e-mol have been developing a new interface. This new interface is faster, more flexible, and more eye catching. Also extensive hardware upgrades have allowed this feature filled upgrade to run much faster then before. As always if you have any questions or comments with the new e-mol please let us know. We at e-mol are currently working on a whole new look! Not only are we going to make e-mol more pleasing to the eye, we are also working to make it easier to use. During this change, you should not notice any down time. e-mol should be 100% accessable throughout the change over. One of the changes we are looking at is a new interface. This means an entirely new color scheme and new buttons. We are also adding a new search feature. This will allow you to search through your messages for a word or phrase. As some of you may have noticed, e-mol has been inaccessable at times over the past month. This is due to problems with our current internet provider. We are working with them to resolve the problems, and they think they have them solved. We'll keep our users up to date as more information becomes available. E-MOL'S MAJOR UPDATE HAS ARRIVED! After months of hard work and dedication, e-mol finally has it's database! We have added all the features that we announced back on January 20, plus many more! We hope we have addressed most or all of your problems or requests. If you find any problems, or would like a feature added, please let us know by e-mailing us at Questions/Suggestions. We think the new e-mol is a vast improvemant over the old one! E-MOL MAJOR UPDATE COMING! For your e-mail convenience, E-mol will acquire a database. This will allow E-mol users to save their mail on E-mol's server. Ultimately, E-mol users will receive their mail faster and easier than before. Ability to delete mail from the mail server. 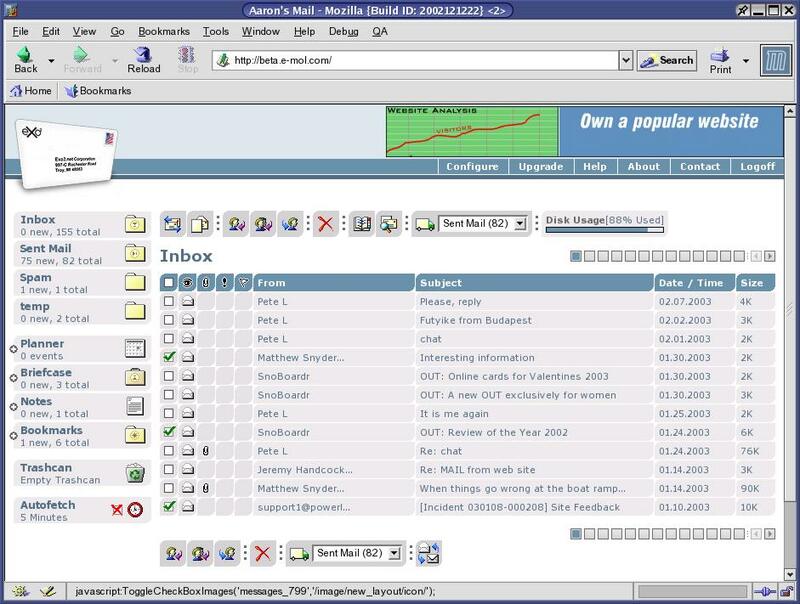 Addition of mail filters, which allow users to sort their mail instantly as it is received. Multiple folders were added to allow users to sort their messages. E-mol users can customize the number of messages that will appear on the screen at one time. E-mol's goal is to make e-mail easy and an enjoyable experience with the help of new additions and improvements. For answers to questions or suggestions, click on the Questions/Suggestions link and e-mail us! In the past week, E-mol has undergone more changes, including the addition of the new option buttons along the left side of the screen. One of the new option buttons added is Utilities. At the present time, E-mol users can create signatures, modify them, and attach them to the end of each e-mail. Recently, E-mol has seen some great changes. As a result, we have decided to document them for our users in creating the E-mol news option button. For a more organized display, we moved half the buttons which were all originally on the left of the screen. These newly placed buttons are now only viewable when the user is reading their mail. In addition, we have added an address book to E-mol for users to keep track of other e-mail addresses. The New Account section has been removed. For information regarding new accounts, please see the FAQ section. Help and FAQ have both been revised to be more user friendly.